ArrayIt Human Genome Microarrays contain 26,304 long oligonucleotides specific for 25,509 fully annotated human genes. 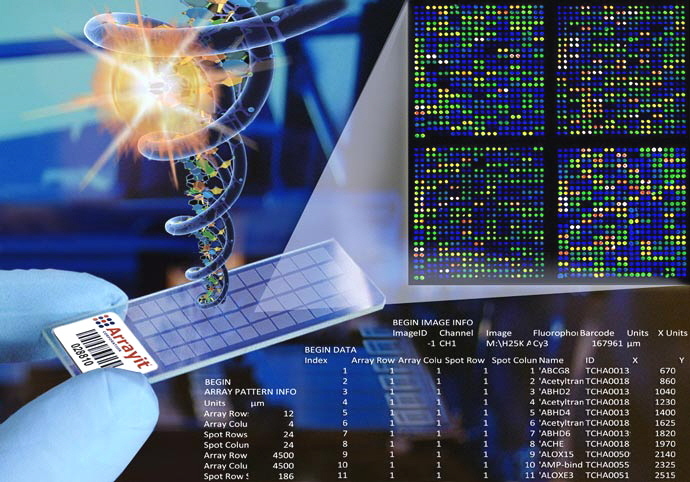 Our revolutionary one spot-one gene design utilizes the most advanced bioinformatics, contact printing, and surface chemistry to deliver performance specifications of unprecedented specificity and sensitivity, allowing streamlined data analysis and mining. This all-purpose human genome chip enables a host of scientific applications including DNA and RNA homology studies, gene expression monitoring, artificial chromosome mapping, protein binding studies, and others. Fully compatible with an installed base of >10,000 microarray slide scanners, H25K sets a new standard for human genome microarrays.